Whether you think of them as a fruit or vegetable, tomatoes are a great choice for making delicious jam for the family and friends. 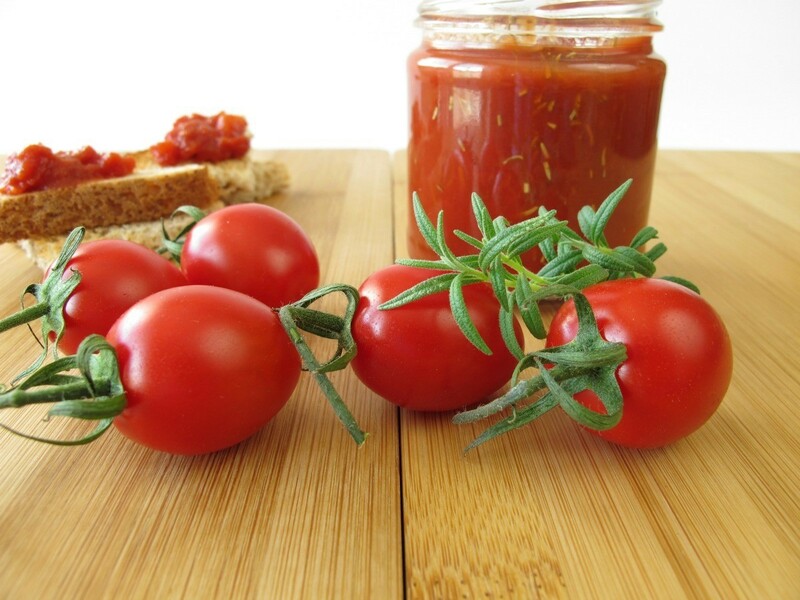 This page contains tomato jam recipes. I would like to have a Tomato jam or jelly recipe. It has been many a year that I made this jam (60s-70's) I really like it however my family didn't so I stopped making it. Here are a few I found on the internet. Measure into a large non reactive pot, discarding seeds and juice left on cutting board. Add sugar. Stir in the ginger. Place pot on stove on high heat, stirring with a wooden spoon until the sugar is dissolved. Maintain a full boil until thick and clear . This takes about 20 minutes. Stir often to avoid burning during the last few minutes. Remove from the heat, allow to stand a moment or two for scum to side and set, so it may be easily removed. Place in hot sterilized jars, cool slightly and seal with paraffin. Yields approximately 2-1/2 twelve ounce jars. This is sweet & spicy condiment that is great brushed on pork , turkey or chicken . It is a dual purpose sauce that can be used while roasting or served with the roasted meat. Just separate a portion to use exclusively for glazing to avoid possible contamination with raw meat present the rest with the final dish and.. voila! lots of flavor layering! Melt the butter in a heavy saucepan, add the ginger and the garlic, stir for one minute. Add the vinegar and cinnamon, cook for another minute. Stir in the rest of the ingredients, reduce heat and let cook for 90 minutes. Let it cool, then remove the cinnamon stick. Serve the jam at room temperature. The glaze will keep for one week in the fridge, but we doubt there will be any leftover! Well it's the end of the season and we are left with tons and tons of little green tomatoes! What to do with all these green tomatoes? We could pickle them, make green tomato salsa, make fried green tomatoes or JAM???? Sure! we tried our regular recipes for tomato jam, hoping that with a little extra sugar they would work and found that we ended up a green ketchup! After several tries, we figured that by introducing some extra acidity from orange juice it was a true jam! Try it with cheese and crackers or on our spicy cornbread as an appetizer. We also found out it gives and extra twist of flavor on turkey and duck! It's the end of the season, so that means the last of the tomato and raspberry crops are up for grabs. There so many salads, sauces, and preserves you can make!. In our quest for the unique, we blended berries, made tomato jams and tried something never done before: raspberries and tomatoes! and why not? after all tomatoes are fruits too! Best of all it makes a an excellent reason to throw a tea party! Place tomatoes in a non-reactive pot with the raspberries. Add orange juice and sugar. Place over medium heat and bring to a boil, reduce heat and simmer for 45 minutes, stirring occasionally with a wooden spoon. Let cool and place in sterilized canning jars. I am looking for a recipe for Yellow Tomato Jam. I have an over abundance of yellow tomatoes! Our family would love this in the winter. Thanks so much! To Prepare Tomatoes - Wash firm ripe tomatoes. Scald, peel, and chop tomatoes. Cover and simmer 10 minutes, stirring constantly. Measure 3 cups tomatoes into a large saucepan. Add lemon rind, allspice, cinnamon and cloves. To Make Jam - Sterilize canning jars. Add lemon juice to the prepared tomatoes in the saucepan. Measure sugar and set aside. Stir powdered pectin into prepared tomatoes. Bring to a boil over high heat, stirring constantly. At once, stir in sugar. Stir and bring to a full rolling boil that cannot be stirred down. Then boil hard for 1 minute, stirring constantly. Remove from heat. Skim off foam. Pour hot jam into hot half-pint jars, leaving 1/4 inch headspace. Wipe rims of jars with a dampened clean paper towel; adjust two-piece metal canning lids. Process in a Boiling Water Canner. Here's an old fashioned one that's simply wonderful. Peel tomatoes; cut into small pieces. Add sugar and let stand 1 hour. Thinly slice lemon with rind. Cook until tomatoes are clear and the syrup is thickened. Pour into jars and seal. I usually squeeze the juice and add zest of a whole lemon. Since this recipe doesn't make much, you could probably just pour into a larger jar and store in fridge. Check The Jamlady Cookbook for more than 10 jams and preserves with tomatoes. In the first recipe if you only use 3 cups of tomatoes for the jam, what do you do with the rest of the 3 quarts? When I was a little child, I had tomato jam, spread on bread (I think). I have looked for it many times, and haven't ever been able to get it. I would like to find the recipe. Lucy, if you Goggle "tomato jam" you'll find several places to pick from. Here is a Yellow Tomato Jam post with some recipes in the feedback. It seems like it would work for any tomatoes. And I pulled out my trusty Joy Of Cooking and I found this recipe. I haven't tried it but maybe I will, if my tomatoes ever start growing. We are having a late growing season this year. Scald and skin 1 lb. tomatoes. Yellow tomatoes may be used with especially fine results. Cover tomatoes with an equal amount of sugar. Let stand 12 hours. Drain the juice. Boil it until the syrup falls from a spoon in heavy drops. Add the tomatoes and the grated rind and juice of 1 lemon or 2 thinly sliced seeded lemons, 2 oz. preserved ginger or 1-4 inch stick cinnamon. Cook the mixture until thick. Let us know what you try and how it turns out. I'm not sure if this is what you are looking for, as this is a recipe you make with green tomatoes, but I know I've made this several times & it's awesome. I've served it to many people over the yrs. and no one can tell the "secret" ingredient & they all love it. It's also really easy. :) Try it, you won't be disappointed. Add 4 cups sugar to 5 cups ground up green tomatoes. Bring to a rolling boil & cook for 10 minutes, stirring constantly. Remove from heat & add 1 large pkg. gelatin (rasp., cherry, strawberry, etc.). Seal in glasses or jars, or freeze. Yes, you can even freeze this.